Located north of Mammoth Lakes on 395. Make the left hand turn right across the street from the Shell Station, then your first left, then stay to the right. Park in front of the fallen tree. 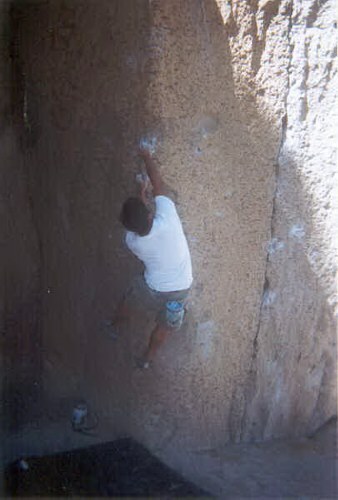 This area offers deceptively steep, extremely sharp, and footwork intensive volcanic tuff. This area is on BLM (Beareau of Land Management) land. You can, therefore, camp anywhere. Fire permits are required, and good taste is recommended...in other words...don't sleep near the boulders. Make yourself a campsite away from the rock where you won't be disturbed...and you wont disturb others. Al Amores works one of the many fine aretes. Photo-Chris Morrison. Click images be4low for more pics of Bachar's Boulders.